Dot and Sheila’s Four Peaks Challenge – Please Donate! Who are these two Grahams and Donalds, I can hear our husbands asking?? All will be revealed! Myself (Dot Still) and Sheila Watson compete in the equestrian sport of Le Trec. We have been short and long listed respectively to represent Great Britain at the Le Trec World Championships in Mafra, Portugal in Sept this year. Le Trec is a fantastic sport which requires endurance, agility, obedience, trust and fitness for both horse and rider and a skill for reading a map (rider only!!!) We both compete at the highest level in the UK and have represented Scotland on many occasions. Both of us now have our sights set at getting onto the British team. The team for Portugal is self funding and it falls to those who have been listed to raise as much as possible to enable a full GBR team to compete. Sheila and I have decided to raise funds by completing a challenge involving at least three of the skills we require for our sport: fitness, agility and map reading skills. We may have to utilise ‘trust’ at some point in the day too! We are going to walk a circular route of 18km around Culter Fell, near Biggar in South Lanarkshire. It is quite a challenging route, taking in 2 Grahams; Culter Fell (748m) and Gathersnow Hill (688m), and 2 Donalds; Hudderstone (626m) and Hillshawhead (652m). We are anticipating a long but enjoyable day in the hills and hope to be finished inside 7 hours. 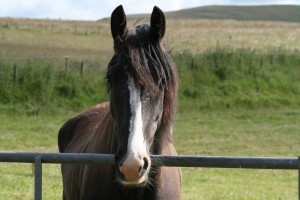 We have also decided to raise funds for Equine Grass Sickness Fund at the same time. Both of us have had the misfortune of dealing with this horrible disease first hand and think that this charity is a very worthwhile equine cause. The British Horse Society have kindly agreed to collect all monies raised and to send 50% of it to Equine Grass Sickness Fund. One of the photos in our gallery is of Eddie Nine Lives (Eddie) who survived grass sickness and his story is featured on EGSF Facebook page. He now has his own Facebook page too, clever pony! Knowing that we have your support will help us through our challenge. Thank you for reading our story so far. We will give you updates on training and will put up some photos of our day on the hills.